So, after half an hour we arrived in our hotel in Bermatingen from Friedrichshafen. The rooms were so comfortable and cozy...oh, I wanted to relax a bit in my inviting bed, but the final decision was to go out again and rapidly; we had just the time to change quickly our clothes, and…. Immediately we were on board to reach Meersburg, the closest town on Constance lake coast from our hotel position. While driving towards that village, some last orange rays from the sun were falling on the dark hills in front of us. They painted nice black silhouettes of life nearby, such as bare trees scattered in vast cultivated fields, and solitary people walking along the pavements, beside the streets. It was like seeing a suggestive show. A charming countryside landscape surrounded us; meanwhile, nature started sleeping under the twilight sky. In 15 minutes we arrived to Meersburg old town. The fascinating medieval style was immediately recognizable in the buildings look. The weather was fine and we were enjoying a pleasant evening in the ancient history, after having experienced the modern and fashionable Friedrichshafen afternoon life. So we started walking among the alleyways of the historic center, reserved to pedestrians, while searching for a restaurant for our dinner. During that short tour, the city captured our attention instantaneously. 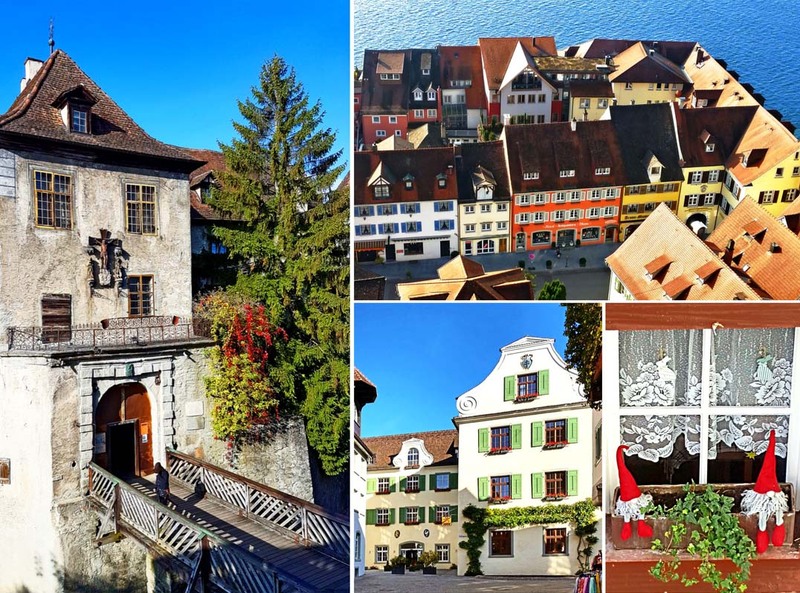 It was a great surprise: I thought to find a beautiful hamlet, but it was even better that night, as I could feel a magical atmosphere in the old Meersburg. It was dark and quiet while we were walking among the wet streets; faint orange lights from the ornamental lampposts illuminated slightly the typical and enchanting old style houses; only few persons were around, as if the town had been abandoned, whereas life filled the characteristic wooden taverns, and an inviting smell of soup and roast spread out in the air. Without a reservation, it was nearly impossible to find available seats in the restaurants; at the end we ate in an asiatic fast-food, where we finally had our tasty dinner. Later on, we were very tired and went back directly to the hotel. We thought our exploration would be helped by the daylight. So, after a good nightly rest and a plentiful breakfast, we were again ready for discovering Meersburg. What the night before had appeared captivating, looked sensational in the sunshine! 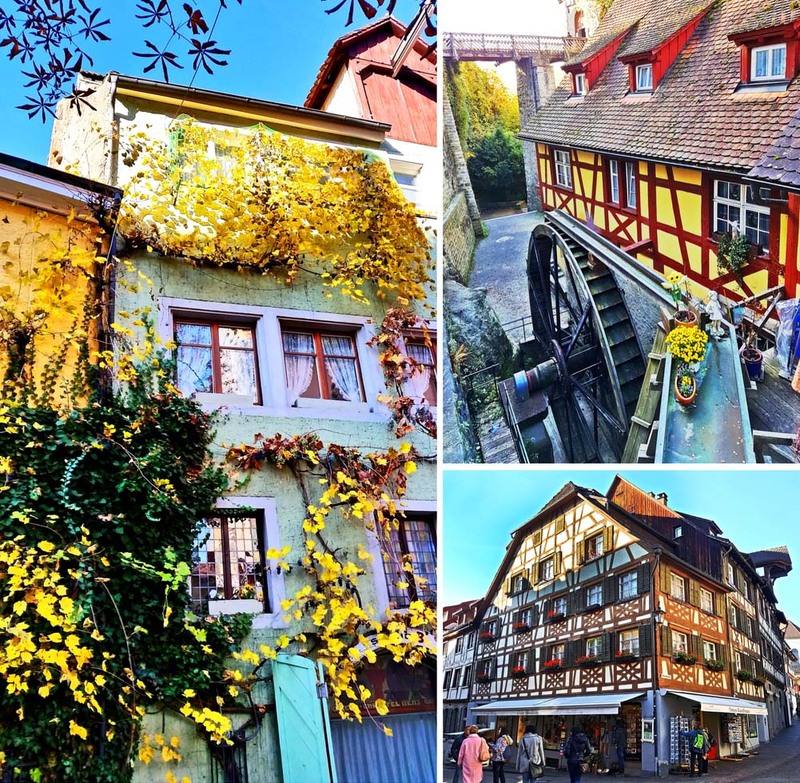 We could appreciate the details of those amazing and singular buildings, characterized by medieval and baroque styles, and we could admire the peculiar structure of the timbered frame houses, made by means of wood columns. I really love this kind of architecture, I encountered in Alsatia for the first time. I can say that having a walk among half timbered houses makes feel you like the main character of a fairy tale. 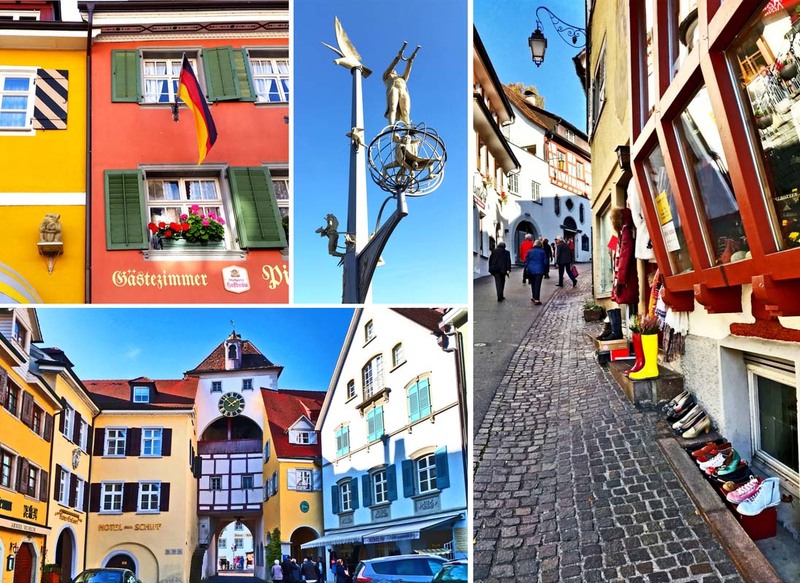 We realized that Meersburg holds lots of marvellous memories from the past, and later on I discovered this city belongs to a project named Deutsche Fachwerkstrasse. That is a 3000 Km long route of half timbered houses, which crosses almost the whole Germany. So happy that I got new hints for future vacations ☺. The historic center of Meersburg is essentially located on a hillside descending to Lake Constance. In the upper town, you can find mostly old buildings, like the ones I described before, and relevant monuments, such as the medieval fortress, built in 630 by Merovingian dynasty. This “Old Castle” is nowadays a museum. We paid the tickets for the official tour, costing around 12 euro per person. It was a really interesting experience; I can recommend it, because a lot of rooms were accessible and each of them was set up in its original status. We could then visit important salons for meeting, bedrooms, kitchens, prisons, torture chambers, and so on, with their authentic or reproduced stuff. I can conclude that we spent a lot of valuable time in the old fortress, by learning how people used to live long time ago. 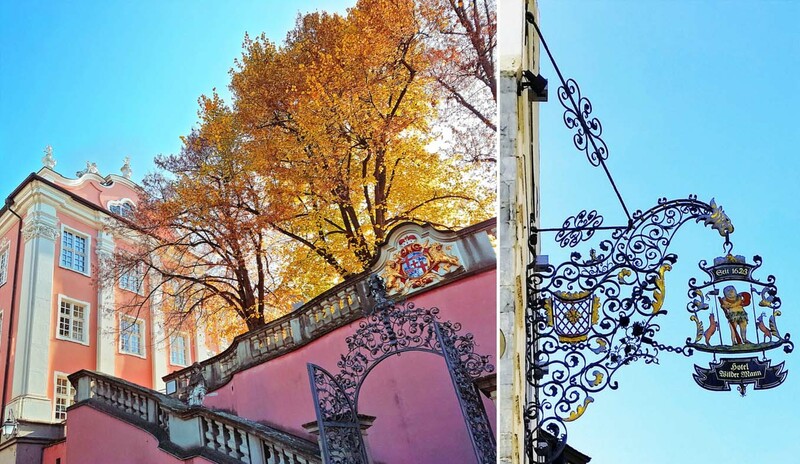 In the upper city part, we found also the “New Castle”, from year 1750, which is characterized by a baroque style and built for the prince-bishops of Constance. There is a nice panoramic garden-terrace in front of that edifice, from where we took wonderful lakescape pictures. I can say that upper town holds definitely many treasures. But fascinating was not only a privilege owned by ancient palaces: every street or square bewitched the passengers with bizarre and colored facades, curious ornaments, blooming balconies, medieval souvenir shops...Autumn nature also played a main role by creating splendid composition scenes around the city. I was so inspired that I took lots of pictures, which surely explain better this exciting beauty concept I mean. While exploring those alleyways I felt like in a fantasy world. And what about lower town? Here you meet the newer part of historic Meersburg and come back to modern times; you can enjoy the vivid atmosphere of a long and neat seafront, with pleasant cafés and restaurants, where you should definitely try a palatable meal or a drink, while facing the quiet Lake Constance. It felt a little bit like home to me, when I used to walk along “Lungo Mare Alfeo”, a nice promenade next to the sea in old Siracusa, the town from which I and my family come from. Thanks the wonderful weather, a lot of tables were set outside. And we couldn’t miss a lunch there, under the warm sun and in front of the lake. Later on, we continued our exploration in lower Meersburg, with stops in typical shops too. We bought 5 kg apples coming from this area for only 5 euros. And they really tasted delicious. But we hadn’t much time left: Constance city waited for us! I like old castle and adorable gnomes! What a wonder the castle! I think you didn't make pictures iside, but thank you for your summary. Grazie! Con dei posti così le foto non possono che essere magnifiche. Sto già lavorando a un nuovo racconto di viaggio. Presto lo pubblicherò. Grazie ancora del sostegno!